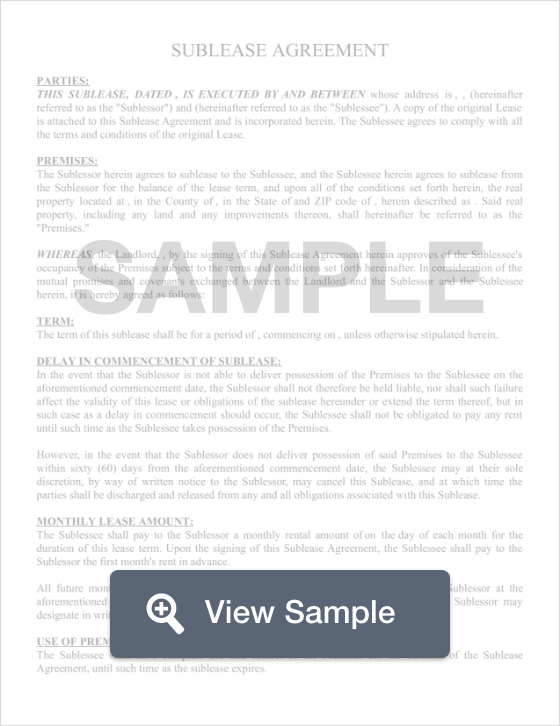 What is a Missouri Sublease Agreement? Missouri Sublease Agreement: What Is It? In Missouri, a sublease agreement is an agreement between two tenants; one who will be moving out of an apartment and one that will be moving in. A sublease agreement grants the sublessee (the tenant moving in) the right to move into the unit and pay rent just as the original tenant did. Sublease agreements are often temporary agreements that last anywhere from a month to a year, but sometimes these agreements can last for the duration of the original lease term. These types of situations where the original tenant needs to leave the rental occur often because of family emergencies, temporary work relocations, military deployment, or even permanent relocation. Regardless of the terms and conditions, it is very important to have a sublease agreement in writing in order to protect both parties. Missouri Subleasing Laws are very clear. A tenant must obtain written permission from a landlord before proceeding with a sublease agreement. If a tenant proceeds with a sublease agreement without written permission, the landlord has the legal right to double the tenant’s rent.